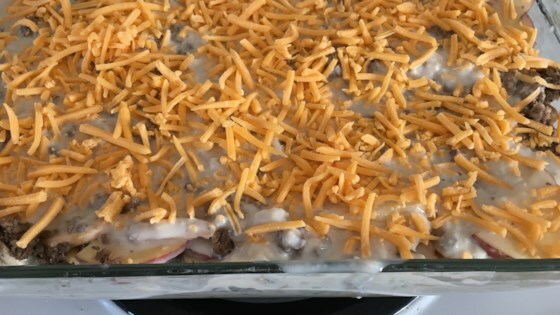 "A good family casserole with ingredients I usually have on hand." Preheat oven to 350 degrees F (175 degrees C). Grease a 7x11-inch baking pan. Mix 1 can cream of mushroom soup, mushrooms, 3/4 cup milk, seasoned salt, and black pepper in a bowl; fold in potatoes. Spread half the potato mixture into the prepared baking pan; top with Cheddar cheese. Spoon 1/2 the ground beef over cheese layer. Top ground beef layer with remaining potato mixture; layer with remaining ground beef. Mix remaining 1 can cream of mushroom soup with 1/4 cup milk; pour mixture over ground beef layer. Bake in the preheated oven until casserole is bubbling, about 1 hour 20 minutes. Sprinkle French-fried onions over casserole; return to oven for 5 more minutes. Family loved it. I left out the mushrooms because the kids don't like them and it was still wonderful!